Authors: Wang C, Oshima M, Sato D, Matsui H, Kubota S, Aoyama K, Nakajima-Takagi Y, Koide S, Matsubayashi J, Mochizuki-Kashio M, Nakano Yokomizo T, Bai J, Nagao T, Kanai A, Iwama A#, Sashida G#. 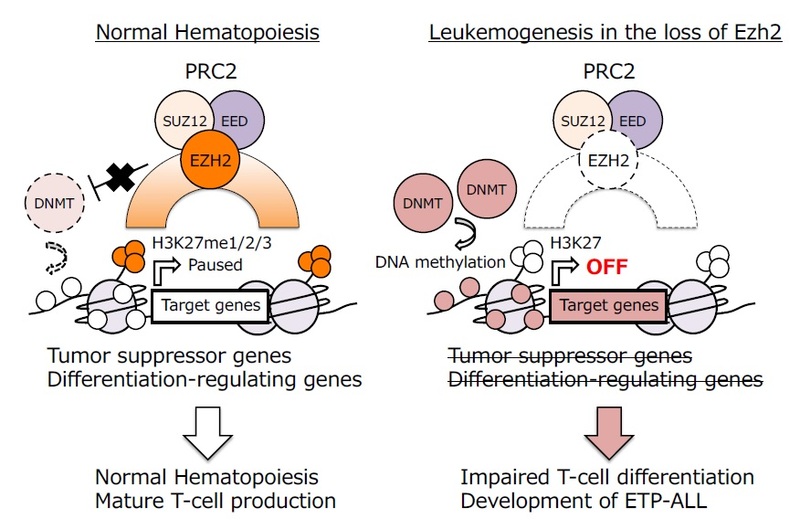 Title as published: Ezh2 loss propagates hypermethylation at T-cell differentiation-regulating genes to promote leukemic transformation. 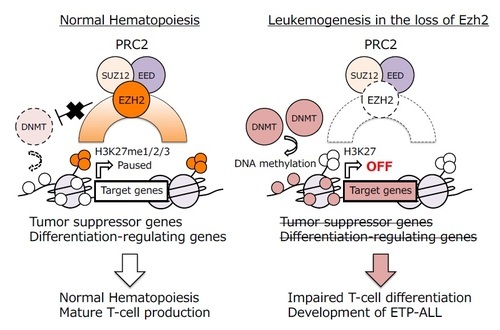 The loss of Ezh2, one of the polycomb repressive complex (PRC) 2 genes, in p53-null hematopoietic cells induces Early T-cell precursor (ETP)-acute lymphoblastic leukemia (ALL) in mice. PRC2 protects T-cell differentiation-regulating genes from DNA hypermethylation, while Ezh2 loss promotes leukemic transformation. These results provide the basis for specific rational epigenetic therapy for ETP-ALL with PRC2 insufficiency. Early T-cell precursor (ETP)-acute lymphoblastic leukemia (ALL) is a new pathological entity with poor outcomes in T-ALL and is characterized by a high incidence of loss-of-function mutations in polycomb repressive complex (PRC) 2 genes. We herein generated a mouse model of ETP-ALL by deleting Ezh2, one of the PRC2 genes, in p53-null hematopoietic cells. The loss of Ezh2 in p53-null hematopoietic cells impeded the differentiation of ETPs and eventually induced ETP-ALL-like disease in mice, indicating that PRC2 functions as a bona fide tumor suppressor in ETPs. A large portion of PRC2 target genes acquired DNA hyper-methylation at their promoters following reductions in H3K27me3 levels upon the loss of Ezh2, which included pivotal T-cell differentiation-regulating genes. The reactivation of a set of regulators by a DNA demethylating agent, but not the transduction of single regulator genes, effectively induced the differentiation of ETP-ALL cells. Thus, PRC2 protects key T-cell developmental regulators from DNA hyper-methylation in order to keep them primed for activation upon subsequent differentiation phases, while its insufficiency predisposes ETPs to leukemic transformation. These results revealed a previously unrecognized epigenetic switch upon PRC2 dysfunction and provide the basis for specific rational epigenetic therapy for ETP-ALL with PRC2 insufficiency.